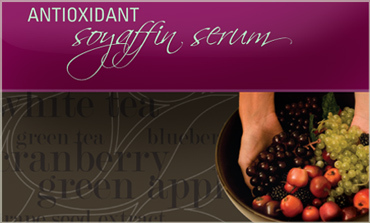 & 1 complete hand treatment with Soyaffin serum. Composed of soy extracts, shea butter, American beeswax, and our Antioxidant blend, Soyaffin is an all-natural skin care treatment that works with heat to penetrate deep into the skin. Soyaffin helps create a protective seal that continues to renew, soften, and protect skin for days.